On her big day, every bride should feel beautiful and come to slay. Which was exactly what went down when we spotted this gorgeous bride, Salewa Hassan-Odulake, on our Instagram feeds. For her big day she donning a Victorian style wedding dress that has simply left us speechless. 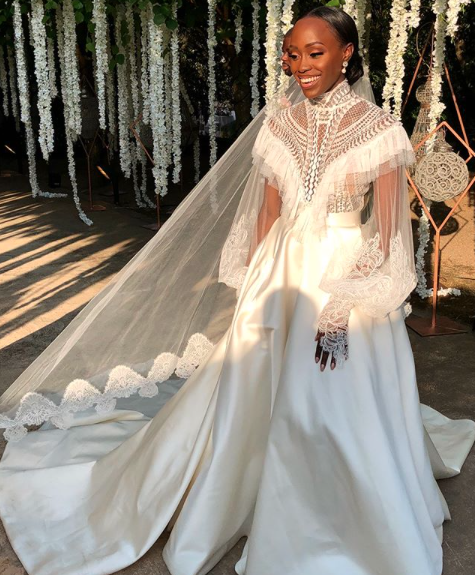 Designed by Australian duo, Jacob Luppino and Anthony Pittornio of J’Aton Bride, Hassan-Odulake took royal wedding vibes to a new level. Not only did the bride stun, but her bridesmaids did as well, wearing gold gowns accented with large bows. The couple tied the knot in Barcelona and we’re wishing them nothing but the best in their lifetime of bliss!